As expected, Spike TV has announced they will offer up a pair of freebie fights to kick off the “UFC 128: Shogun vs. Jones” festivities on March 19th. The edgy network confirmed Wednesday their show will feature the thrilling lightweight scrap between Edson Barboza and Anthony Njokuani, as well as the 205-pound battle between Luiz Cane and Eliot Marshall. The live lead-in will start at 9PM ET/6PM PT, with the pay-per-view broadcast beginning immediately after at 10PM ET/7PM PT. Hopefully, additional gratis fights on Facebook will be announced shortly. The UFC first offered the teaser for UFC 103 in September 2009 to help promote the struggling fight card, and the special proved to be an effective means of generating last-minute PPV buys. UFC 128 takes place inside the Prudential Center in Newark, New Jersey. 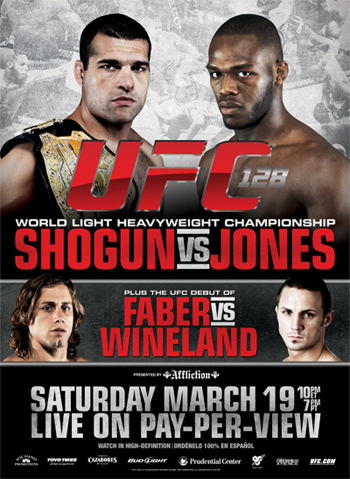 A light heavyweight title fight between champ Mauricio “Shogun” Rua and Jon Jones will headline the card.